All Mapping Yourself participants were already deeply engaged in their caregiving efforts, so the fact that they felt they learned a lot about their situations is very meaningful. It supports the project’s premise that caregivers can benefit from assistance and tools to better understand and manage their lives. Due to the experimental nature and limited time frame of the effort, participants were exposed to a wide range of tools very rapidly, too rapidly for deep comprehension. A slower learning curve will likely result in greater long-term impact. We learned not to mistake a person’s lack of technological sophistication with a lack of critical thinking skills. Even if a person has difficulty setting up a consumer-level technology, they may still be able to make sophisticated judgements on the resulting data by reflecting on their real-world lives. Brief, small-data tracking can produce valuable insights. For example, tracking incidents of phone calls pertaining to caregiving for one or two days, resulted in rich appreciation of daily busyness and fragmentation. Before committing to any complex or long-term tracking, it would best to try something quick and easy first. This is the third in a series of five blog posts on the 2017 Mapping Santa Barbara project. The first post gave an overview of the project and key findings, and the second looked at the transformational impact experienced by the Promotores. The next post describes institutional adoption of Atlas CareMaps. The final post describes how the community continues to innovate to expand on its success. You can download the full Mapping Santa Barbara final report. There is a lot of hoopla these days about the power of combining sensors and AI to passively track and assess people’s health, and to then make expert recommendations to improve the situation. In addition to the real promise these new technologies hold, the excitement is also due to assumptions: that people are too busy or lazy to track things themselves; that people lack the expertise to make good judgments; that quantitative data is far superior to observational data; and that the more data the better. Instead, what we discovered in the “Mapping Yourself With Guidance” portion of the Mapping Santa Barbara project is that the most meaningful and impactful learning resulted from active engagement in both data collection and analysis. A small set of data, deeply considered, was far more valuable than lots of data automatically collected and analyzed. Six family caregivers met monthly, for four sessions from July to October, with two self-tracking experts, Rajiv Mehta, CEO of Atlas of Caregiving, and Dawn Nafus, Anthropologist and Senior Research Scientist at Intel. Participants explored new methods to track and assess their own caregiving activities and contexts. They experimented with sensor devices to track movement and sleep; paper-based tools (the Atlas CareMap, and a newly developed visual activity log) to track activities, interactions and emotions; and a concept of “track-1-thing” to understand the impact of just one type of activity. “I became aware of stuff I never thought about — like the diversity of emotions that are experienced. It’s not like I didn’t know I had feelings, but I had never taken the time to look at them so explicitly as when doing the tracking project. It really opened my eyes to the RANGE of emotions going on inside.” Mapping Yourself project participant. Tracking steps using a Fitbit helped one participant realize that the more he walked, the more his care recipient walked. Another participant discovered that her care recipient logged more than 20,000 steps during his nightly wandering. The response from participants about the overall Mapping Yourself effort was uniformly and strongly positive. They told us they gained new and deeper insights into their situations, seemed to enjoy trying new things, and found the discussions worthwhile. It was clear, from participants’ comments and body language, throughout the four meetings, that they were very pleased with the project and were learning a lot about themselves and their caregiving situations. 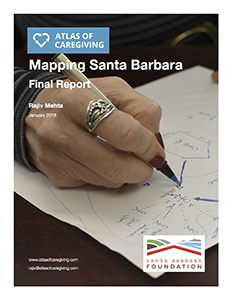 More details about the experimental methods used, outcomes, and learnings are found in the Mapping Santa Barbara final report. 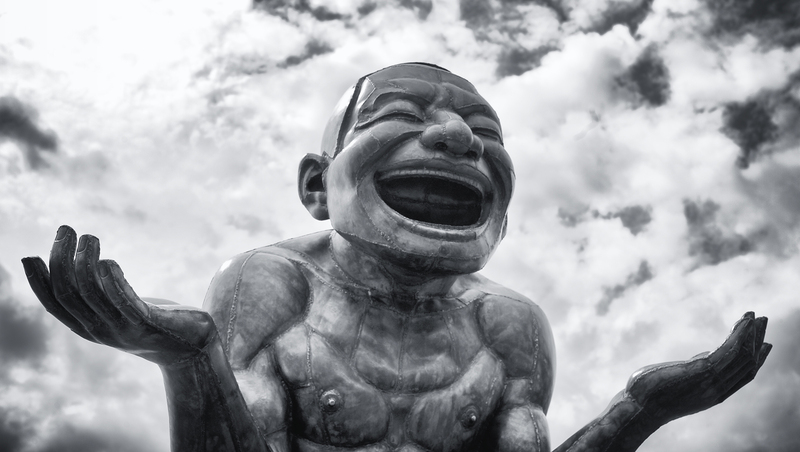 Photo: image of “A-maze-ing Laughter” from the Flickr collection of Wee Sen Goh.